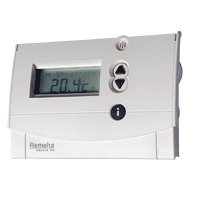 This topic is intended to collect facts about how different thermostats work with the OTGW, to be consulted by people wanting to purchase a thermostat. Please only post information here. Questions should go to some other topic. I will combine the information in one post per thermostat type. Supports setpoint override to .01 degrees (display rounded to .5 degrees). Supports both temporary and constant setpoint override. Supports clock adjustment (time and day of week only). Supports display of outside temperature provided via opentherm. The Hometronic icon is displayed when a remote setpoint override is active. Supports setpoint override (requires firmware version 19 or higher). Supports both temporary and constant setpoint override, but needs up to 12 minutes to learn which one was requested. Supports clock adjustment only at startup. Supports display of outside temperature. Can take advantage of Smart Power from the gateway. Remote setpoint override is disabled by default and has to be enabled via the menu. Supports constant setpoint override only with a resolution of .2 degrees. Supports constant setpoint override only. Supports setpoint override, but only with a resolution of 1 degree. Supports display of CO2 value. Supports display of Relative humidity value. To use the Remote setpoint override, the TELE function must not be enabled. The Hometronic icon (a "H" with a 'roof') is displayed when a remote setpoint override is active. Does not support clock adjustment. Remote setpoint override must be enabled via the menu. The TELE function must not be enabled at the same time.